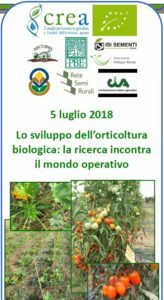 On 5 July 2018 researchers meet stakeholders for the innovation of organic horticulture in Italy. Open day at CREA-OF Monsampolo (Italy), where participatory breeding is underway on a MAGIC population of tomatoes developed for organic condition in cooperation with seed company ISI Sementi. CREA Monsampolo is a LIVESEED partner engaging with participatory organic tomato breeding, in cooperation with ISI sementi. For more info read the program or contact gabriele.campanelli [at] crea.gov.it.